Growing vegetables in your backyard, community garden or in some containers by the kitchen door is a great way to feed yourself -- whether it be just a few ripe tomatoes in August or a full-fledged homesteader's garden, you are on the right path to feeding yourself and your family. Gardening is a great way to improve how you eat while spending some contemplative time outside. With all of these benefits in mind, it is easy to jump into gardening enthusiastically, and you will reap even more rewards with a little bit of planning. In Vermont, our gardening season seems short but can be stretched almost year round with a few simple tips. 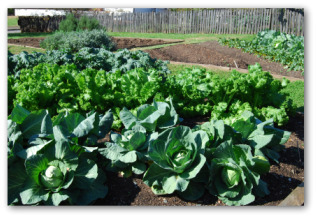 I always recommend that people take a look at how their vegetable gardens have been in the past and find just one or two things they would like to improve so that they can grow more of it for a longer season. For example a common question I hear is "how can I keep cilantro from bolting?" Well, in short, you can't! But with a few changes in your gardening practices, you can grow it all spring, summer, and fall without ever seeing it go to seed. The trick is to understand the life cycle of each vegetable or herb and how to best plant it to maximize it's harvest. With certain crops, like zucchini, it is best to understand how prolific they are and to plant them conservatively so that the entire garden (and thereby your diet and your neighbors' diet) is not taken over with just one thing. It is also helpful to plant things seasonally so that the harvest is not so overwhelming in August with little to eat before or after. Or sometimes we just want fresh salads all summer, but don't replant and are left salad-less after July 1st. Lettuce can be grown from seed or from transplants. Seed grown lettuce is often grown in a row that can be cut and will re- grow a few times - think of mesclun. Transplanted lettuce can be grown to produce full heads like what you find in the store. Both methods require regular planting every week or two for a continuous harvest. Or it transplanted for full heads from late April / early May through early August. Some people will transplant a few plants and plant some seeds at the same time in a different area; this method provides two generations of lettuce and two types of salad greens. Once the cut lettuce becomes bitter in the heat of summer, it is best to pull it up, recondition the soil with compost, and plant something else. If the goal is to always have fresh lettuce, it is very simple to do if you remember to replant it. You can even purchase a number of plants and hold some in their pots in a shady spot and only plant out a few each week. You can seed it yourself in trays or pots and follow this same method. Having several varieties, cold-tolerant ones for spring and fall plantings, and heat-tolerant ones for mid-summer, will produce the best flavor. Cucumbers, cantaloupes, and zucchini and summer squash are best in quality when well tended.Just a single plant or two of any of those is usually enough for the home gardener, but by planting it two to three different times, the quality will always be good. The best planting dates are: June 1st (or last week in May if you are in a warm spot), July 1st and July 15th. This method will ensure a continuous harvest of prime looking vegetables. Just remember to pull out and discard the pest- and disease- prone older plants. If your compost gets very hot and is well managed, it is okay to compost these plants. Pest problems will diminish when the older, less healthy plants are removed. Arugula, Cress, and other cutting greens for saladsare best if sown or transplanted on a weekly or biweekly basis. Again, a small amount can be seeded next to the transplanted crops in order to give you 2 generations at once. This way you can have smaller quantities coming in at various times. Broccoli gives the gardener a couple of options. It is best if transplanted and can be planted 3 dates in the spring and 3 dates in late summer for a continuous harvest. 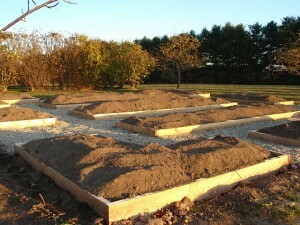 then Early August, mid August and early September for the fall plantings. Full heads can be harvested and the plants can stay in the ground to produce side shoots. can be planted every couple of weeks late April through early August. Boc Choi and Cauliflower are not as heat tolerant and should be planted around the same dates as broccoli (see above). It is best to use row cover like Reemay on these young transplants so that flea beetles do not destroy the plants. Spinach is another one that does not do well in the heat, but can be planted multiple times in spring and late summer. It can also overwinter with a little straw mulch for very early spring eating. he last plantings in September are the ones which will be over-wintered and eaten the following spring. Apply straw mulch on overwintering spinach in December once the ground is frozen. Beets, Carrots, Turnipscan be planted every two or three weeks from mid-April until about the third week in July. Summer carrots are not the same as fall carrots and certain varieties do better in summer than in fall. The flavor of fall carrots is much sweeter, so I usually plant a larger patch in the fall. Fall carrots can also be stored all winter without going bad due to their lower moisture content. I don't love summer carrots, so I often skip those. Remember, it is all about what you like to eat. can be planted 1 to 3 times during the season, from mid May until early July. These need lots of water and benefit from straw mulch to hold the moisture evenly around the roots. Bulb Fennel and radishes are similar to lettuce -- they can be planted each week if really loved, but they bolt in the heat and do best in the cooler temperatures of spring and fall. They are best if planted late April to early June and then again late August to mid September. They are cold tolerant and hold well in late fall. Radishes are grown from seeds and fennel is best transplanted. Fennel also benefits from a straw mulch - even moisture around the roots is what helps it make larger roots. Corn -- it is possible to do multiple plantings over different weeks, but an easier method is to plant all at once, but with various varieties that have different days to maturity. There can be a 40 day span between early and late varieties. the home gardener can sow 2 or 3 varieties in late April with various days to maturity. Fall plantings are sometimes successful but are weather-dependent. These should be done in mid August. Growing vegetables in your backyard, community garden or in some containers by the kitchen door is a great way to feed yourself -- whether it be just a few ripe tomatoes in August or a full fledged homesteaders garden, you are on the right path to feeding yourself and your family. Gardening is a great way to improve how you eat while spending some contemplative time outside. With all of these benefits in mind, it is easy to jump into gardening enthusiastically, and you will reap even more rewards with a little bit of planning. In Vermont, our gardening season seems short but can be stretched year round with a few simple tips. I always recommend that people take a look at how their vegetable gardens have been in the past and find just one or two things they would like to improve so that they can grow more of it for a longer season. For example a common questions I hear is "how can I keep cilantro from bolting?" Well, in short, you can't! But with a few changes in your gardening practices, you can grow it all spring, summer, and fall without ever seeing it go to seed. The trick is to understand the life cycle of each food crop and how to best plant it to maximize it's harvest. With certain crops, like zucchini, it is best to understand how prolific they are and to plant them conservatively so that the entire garden (and thereby your diet and your neighbors' diet) is not taken over with just one thing. It is also helpful to plant things seasonally so that the harvest is not so overwhelming in August with little to eat before or after. Succession Planting for Successful Gardening Certain crops should be planted multiple times throughout the season to ensure a continuous harvest. How often you plant is a matter of taste and space and time. The following list describes the maximum you could do with each crop, but adjust according to your needs and priorities -- this is just a guide. Lettuce can be planted from seed or from transplants. Seed grown lettuce is often grown in a row that can be cut and will re-grow a few times. Transplanted lettuce can be grown for full heads like what you find in the store. Both methods require regular planting every week or two for a continuous harvest. It can be planted from seed in mid-April to mid-August for cut greens and transplanted for full heads from late April through early August. Some people will transplant a few plants and plant some seeds at the same time in a different area; this method provides two generations of lettuce. Once the cut lettuce becomes bitter in the heat of summer, it is best to pull it up, recondition the soil and plant something else. If the goal is to always have fresh lettuce and it is very simple to do if you remember to replant. Cilantro is very similar to lettuce in its growing habits. It will grow up to a point and then goes to seed, or bolts. It i will bolt more quickly in summer heat and, conversely, will stand ready to harvest for many weeks in the cool weather of spring and fall--even early winter. It can be transplanted or grown from seed. Like lettuce, it is simple to do both at the same time, thereby giving the gardener two generations. Cilantro seed is coriander, so it does have a use if you enjoy that flavor. Dill can be treated just like cilantro, and like coriander seed, dill seed heads have a use in the kitchen, so it is fine to let some of the dill patch go to seed. Basil can be planted multiple times for best results. Plants can be pinched to slow down the flowering, but best flavor will come from newly replanted basil plants. Heat loving. Should only be planted once soil temps are in the upper 50's. Cucumbers, cantaloupes, and zucchini and summer squash are best in quality when well tended. Just a single plant or two of any of those is usually enough for the home gardener, but by planting it three different times, the quality will always be good. The dates are: June 1st (or last week in May if you are in a warm spot), July 1st and July 15th. This method will ensure a continuous harvest of prime looking vegetables. Just remember to pull out and discard the pest and disease prone plants. If your compost gets very hot and is well managed, it is okay to compost these plants. Pest problems will diminish when the older, less healthy plants are removed. Arugula, Cress, and other cutting greens for salads are best if sown or transplanted on a weekly or biweekly basis. Again, a small amount can be seeded next to the transplanted crops in order to give you 2 generations at once. This way you can have smaller quantities coming in at various times. Broccoli gives the gardener a couple of options. It is best if transplanted and can be planted 3 dates in the spring and 3 dates in late summer for a continuous harvest. I would choose late April, early May and mid May for the spring plantings and then Early August, mid August and early September for the fall plantings. Full heads can be harvested and the plants can stay in the ground to produce side shoots. Green Beans -- are best when fresh and young. The seed is relatively cheap, so it is better to rip out old plants and have new ones coming along regularly. Having multiple plantings also means that no on is stuck picking beans for ours on end. Sow new seeds when the previous or first generation is about 6 inches high. Boc Choi, Cabbage, Scallions, Cauliflower -- these can also be planted multiple times. Cabbage holds well in heat and can be planted every couple of weeks late April through early August. Boc Choi and Cauliflower are not as heat tolerant and should be planted around the same dates as broccoli (see above). It is best to use row cover like reemay on these young transplants so that flea beetles do not destroy the plants. Spinach is another one that does not do well in the heat, but can be planted multiple times in spring and late summer. It can also overwinter with a little straw mulch for very early spring eating. Date to plant are (up to every week) mid April to early June and then early August to mid September. The last plantings in September are the ones which will be over-wintered and eaten the following spring. Beets, Carrots, Turnips can be planted every two or three weeks from mid-April until about the third week in July. Summer carrots are not the same as fall carrots and certain varieties do better in summer than in fall. Celery and Celeriac are slower growing and can be planted 2 to 3 times during the season. Mid May until early July. These need lots of water and benefit from straw mulch. Bulb fennel and radishes are similar to lettuce -- they can be planted each week if really loved, but they bolt in the heat and do best in cooler temperatures of spring and fall. Best if planted late April to early June and then again late August to mid September. Very cold tolerant and hold well in late fall, radishes are sown from seeds and fennel is best transplanted. Corn -- it is possible to do multiple plantings over different weeks, but an easier method is to plant all at once, but with various varieties that have different days to maturity. There can be a 40 day span between early and late varieties. Peas -- can be planted every week, but this requires a lot of harvesting, irrigating, trellising, and variety research. It is possible though. More practically, the home gardener can sow 2 or 3 varieties in late April with various days to maturity. Fall plantings are sometimes successful but weather dependent. These should be done in mid August. The following are generally planted just once a year, but the harvest can be staggered with a few tricks: Tomatoes, Peppers, Eggplant -- try a few varieties of each in order to not have everything at once. Determinate tomatoes will provide you with a big harvest all at once which is a good thing for people who make big batches of sauce for canning or freezing. Onions and Potatoes are generally planted all at once, and again a few different varieties will provide you with a longer period of fresh eating. Both onions and potatoes can be stored for long periods of time in cool and dark conditions. Both can also be eaten fresh. Winter Squash is another crop that is just planted once and stored. Best if cured for a week or two in a warm spot before eating. From frugal and fabulous to dizzying drech....that is the risk of the home cooked meal. Sometimes food blogs just sound a little too easy and full of grace. The photos are perfectly shot, as if a food stylist lives in house, and the recipes and anecdotes that accompany those perfect shots are always well mannered, well dressed, and say all of the appropriate food things. Precious. Well, last night's dinner wasn't like that in our house. I set out to make use of some butternut squash leftovers and one of the 8 heads of cabbage currently in residence in my fridge drawer. A simple cheddar/squash souffle and some vinegary coleslaw with boiled dressing sounded good. But first let me confess....I drank coffee earlier in the day. 2 large, strong cups of the stuff. After many weeks of being coffee free, I could easily say it was a BIG mistake. I have to tell myself that I am allergic to the stuff, period. Must stay away. I approached every ingredient as if it were a wild animal needing a fast chase, a violent catch, and followed by a quick wrestle and throw down into waiting bowl or pot. Eggs were smashed accidentally, lumpy squash was beaten to smoothness, without success, using the help of 2 different electric tools - the immersion blender zapper and the under sized hand held mixer - to no avail and butter was scorched before the roux could even get out the door. Many pots, pans, spatulas, whisks and spoons later, I found myself "gently" folding in the egg whites with the grace of an elephant on speed. The batter took up two different souflfe dishes (but one of them was just a brownie pan), and I slid both into the oven. Of course, my impatience made me check on it too often, but still they rose and looked beautiful. At least the one I didn't drop on the open oven door looked beautiful. The spill victim turned into a lovely mess of charred egg and squash smeared all over the window of my oven door, filling the house with a toasty burned egg aroma. The slaw was a little better, but I did manage to get small shreds of cabbage in every nook and cranny of the kitchen and I also tatsed the boiled dressing a little too soon after the said boiling point and still can't feel my tongue. When all was done, we sat, opened a bottle of red (the cork broke in half and I plunged it with great relish down into the bottle, and we had a funny, even tasty meal. Many jokes were made about the crazy housewife who possessed me and the effing souffle she felt compelled to make. All because of some squash leftovers.